Apparently I'm in a throwback kind of mood this week. Throwbacks with a twist, anyway. A few years ago I posted a recipe for The Spicy Lemon on Tokyo Terrace. It is still one of my favorite cocktails but I've allowed it to evolve slightly since its inception. 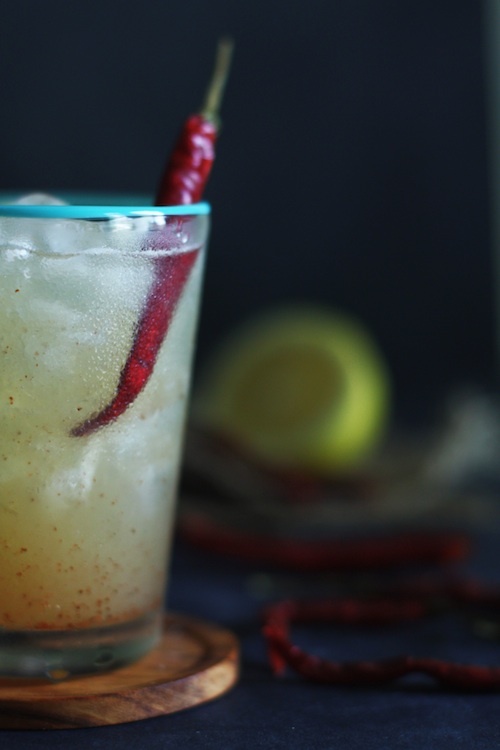 This version is made with a chipotle-honey simple syrup and can be mixed with vodka, tequila, or even rum (National Rum Day is today, by the way). In my fit of nostalgia, I've been thinking of how recipes, like life, can be changed and improved as time goes on. This cocktail reminds me of life in Japan in our second apartment. We could see the river and would often watch the crowds of people who would camp out for the weekend, grilling and drinking and laughing together. Sometimes I would just sit on our balcony and watch people run or cycle up and down the riverside trail. A few of those times this cocktail was in my hand. Life was great then, but it has certainly changed over the past couple of years. Japan to Colorado...family of two and now three... There's always something worth toasting to. The Smokey Spicy Lemon is nothing fancy, but the clean, spicy flavor balanced with sweet honey and lemon juice is impressive for entertaining and simple enough to make any time you like. I've got approximately 1 million peppers growing in my garden right now and I will likely use those to make this cocktail when they are ready. For now, I've used chipotle chile powder. The recipe is versatile so you can play with it using different peppers, a combination of lemon and lime juice, etc. Combine the vodka, lemon juice, and simple syrup in a shaker filled with ice. Shake for 30 seconds and pour into an ice filled cocktail glass. Garnish with the dried chile and serve. Combine the chile powder, honey and water in a small pan over medium heat. Bring to a simmer, stirring constantly. Remove from the heat and allow the syrup to cool. Transfer the syrup to a small container and store in the refrigerator for up to 2 weeks. *Alternate version using fresh peppers: In place of the chile powder, use thinly sliced jalapeno peppers (about 1/2 to 1 whole small pepper, depending on how spicy you want it) or other chile pepper. Use the seeds for extra heat. Omit them for milder heat.